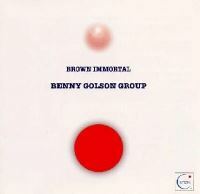 Description: Brown Immortal, recorded in 1997, found Benny Golson in the company of top New York musicians: John Swana on trumpet, Ron Blake on tenor saxophone, Mile LeDonne on piano, Peter Washington on bass, and Joe Farnsworth on drums. The title track is a new composition by Golson dedicated to Clifford brown, written 40 years after the now-classic "I Remember Clifford." In addition, the all-star sextet plays a few standards and Golsons's compositions, both old ("Five Spot After Dark") and new ("Matinee," "Horizon Ahead" and "Ever More"). Legendary percussionist Tito Puente guests on the Golson tune dedicated to him, adding considerable excitement. Overall, I can't help but be impressed by the quality of Golson's writing (especially the new ones) and the quality of the performance. This is a very effective, enjoyable straight-ahead jazz album. Recommended! Produced by Makoto Kimata. Recorded March 30 & 31, 1997, New York.